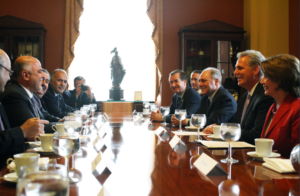 Majority Leader McCarthy today welcomed Iraqi Prime Minister Haider Al-Abadi and a delegation of senior Iraqi officials to the Capitol. Congress came together in a bipartisan and bicameral way to enact the first real reform to entitlements in decades, and I think this is a sign of what’s to come. Delisting the Castro regime is yet another manifestation of the Administration’s questionable policy of accommodation towards America’s adversaries. 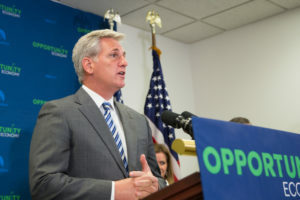 Majority Leader McCarthy spoke today at a Republican leadership press conference about protecting hardworking American taxpayers with legislation on the House Floor this week.